The fifteen foot REAN 1/4" Pro Guitar Cable by Hosa Technology features quality, 1/4" REAN connectors by Neutrik AG, 20 AWG OFC (Oxygen-free Copper) conductors and hi-density 90% OFC braided shielding for excellent EMI and RFI rejection. It's designed to deliver clean, reliable signal with low to no noise and is backed by a limited lifetime warranty. 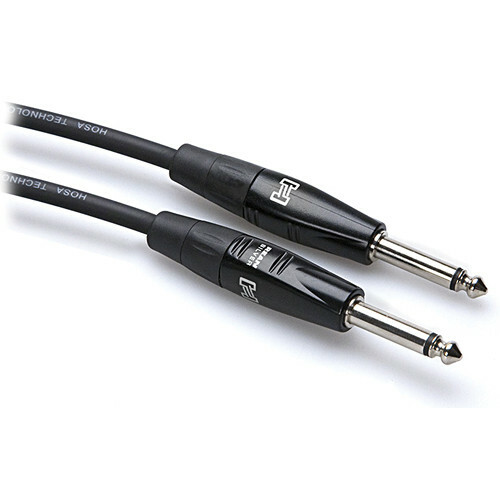 Box Dimensions (LxWxH) 9.2 x 7.0 x 0.7"
REAN 1/4" Pro Guitar Cable - 15' is rated 3.5 out of 5 by 2. Rated 2 out of 5 by Leo from One of the connector barrels rotates instead of being secure Once I received it, just checking to make sure all is OK. One barrel rotates in the connector. Electrically, it seems to work OK. Rated 5 out of 5 by Roman from REAN 1/4 Pro Guitar Cable - 15' by Hosa Good cable, great price!